NO ROCKLIFF? What will we do? It’s alright Fantasy fans, Calvin has you covered once again! The boys are back! After a shocking start to the year, the Sydney Trio are back and firing. After playing 7 games without scoring a ton, Luke Parker knocked one up on the weekend (121pts). He is up against the Saints this week and last year he had 144 on them. But the thing I like about Parker this week is the fact he is playing under the Etihad roof. Check out what he has scored in his most recent games there… 121, 91, 144, 106, 120, 128 and 119. Bang! Now, will Seb Ross tag Josh Kennedy? He hasn’t in the past but he might this week. Kennedy was amazing last week with 122, his best score for 2017. In his last two against the Saints he has been great with scores of 118 and 134. The potential tag here is a danger, but if he can avoid it… he’s going to be awesome. Dan Hannebery has averaged 112 in his last three and out of the boys, he is the man who has stepped up the most. He loves playing the Saints and scored 128 and 133 in his most recent runs. However, if you are looking at one of these boys this week, then Parker would be my pick, especially to trade in. At his price, he’s back and this week he will continue what he started last week. Back in the day, Patrick Dangerfield was a ‘set and forget’ captain for some Fantasy coaches. While I think that saying is stupid and one that does me out of a job, his form is starting to resemble Elliott Yeo of 2016. He had just 88 last week but loves playing the Bulldogs who he meets this week at home where he averaged 120 last year from 8 games, with a lowest score of only 107. Against the Dogs last year, he scored 135 and 143. Before that 110, 110 and 103. Last week, the Eagles had 7 players crack 100+ on the Dogs as the ‘outside’ players racked up huge number. Although this isn’t how you would describe Danger, he’ll still be amazing… and I hate to say it… so will Mitch Duncan. If Andrew Gaff can have 146pts, from 15 marks and 31 uncontested possessions, Duncan can as well. This suits his game perfectly so make sure he’s in your Moneyball team for this big Friday night clash. Oh my… Rory Sloane, 63 and 65 in the last two weeks and for some coaches who paid that top dollar are going mad. The positive here is, Brisbane are easy to score against (3rd) and he’s scored back to back 117s in his last two runs against them. With No Mitch Robinson, surely Sloane shouldn’t have any problems scoring well this week. Guys like this don’t stay down for long and this week, the Crows should get back on the winners board and that ‘should’ mean that Rory is back to his best… but I did say that last week, before Bernie Vince shut him down in a big way. Joel Selwood was the #1 man in the game at one point this year but after not scoring a ton in his last 3 games, his owners are fuming. He had 91 and 102 on the Doggies last year, but this game will feature scorers from the outside like I mentioned above. After averaging 110 last year, Nick Riewoldt isn’t fully fit and playing like the age he is. Occasionally he’ll drift up to the wing, and then he’ll return to the square. As an owner, I’m suffering and when you see 87 next to his name and think “oh at least that better than the 51 from last weekend” that’s not a good thing. He scored 112 on the Swans last year and with this one being under the roof again, I am holding some hope that some kind of a miracle can occur between now and Saturday afternoon. Without being too sad, Tom Rockliff is out this week. It’s devastating but the pig has served us well so far and will be back after the byes ready to oink it up again. But what will we do now? Who is going to save us, because right now it is the time to step up if you want to be the next pig in the pen. One of our piglet’s Tom Mitchell plays the Pies, but will he be tagged by Greenwood? It’s very likely to happen to be honest, who else would he run with? Last week, Greenwood started on Shiel and although I think Tom will be very hard to stop, it is a small concern. Mitchell is currently the #2 player in the game averaging 131 over his last 3 games and Collingwood are actually giving up the 3rd most 100+ scores over the last 3 weeks. Now, in his last two games against them he has scored 132 and 138 and last week, the boys from the GWS didn’t struggle. Four of them cracked the ton and Josh Kelly went bananas for his 163. The third little piglet in our pen is of course Zach Merrett and many will be turning to him this week to replicate the 150 he had against the Cats last weekend. Zach is simply amazing and has averaged 127 this year, carrying a lowest score of only 108 in his last 5 games. He plays the Eagles, a team he had 123 and 137 on in his last two games against them but the points didn’t flow for the Dogs last week, as Bont was the top scorer for the Dogs with just 112. Never fear though… the week before that, five Port players racked up scoring 110+ and Wingard led the way with 132. Oh… it’s also under the roof. Did you know that in 2016, Merrett averaged 119 there from 9 games and even though he’s only played there once this year (108), the timing couldn’t be better for this potential pig to step up when we need him the most. I get criticised (heaps) about not showing the Eagle’s much love so here we go. This week, the boys play the Bombers under the Etihad roof. The Bombers are one of the tougher teams to score against at the moment and they’re ranked at #1 when it comes to restricting 100+ scores, only giving up 3 in the last three weeks. So let’s have a look and we need to start with Luke Shuey, probably not as captain, but as a trade in option as he has that round 12 bye. He dropped under 110 for the first time in his last five games last week, but still managed 101. Andrew Gaff got out in the open last week for the easiest 146 you’ll ever see. 31 uncontested touches and 15 marks… bang. And…. It might continue this week. He had 131 last year against the Bombers last year and he’s already played one game under the roof this year… for 144. The string is still up and Elliot Yeo is not slowing down. It hurts me to say that he is averaging 129 in his last 3 games and that puts him as the 5th most inform player in the game. Dusty Martin v GWS @ SPO – Giants have only allowed 1×120+ score this entire season and with scores of 112 and 132 in his last two against GWS, maybe Dusty ‘could’ be the second. But the way they are restricting teams, it’s very unlikely. Marcus Bontempelli v Geelong @ Skilled Stadium – 112 and 113 in his last two games and with Geelong being the second easiest team to score against over the last 3 weeks, this should be fine for Bont. He scored 85 and 104 against them last year, but if 7 Essendon players can score 100+ against Geelong, so can Bont. Jack Viney v North Melbourne @ the MCG – 132 and 145 in his last 2 and last week, Sydney carved up the Kangaroos with 6 guys scoring over 110. Viney’s hot run will continue. Josh Kelly v Richmond @ SPO – 162 last week and Richmond are the easiest team to score against over the last three weeks, and they give up the 2nd most 120+ scores. Kelly will be huge again. Jack Steven v Sydney @ Etihad Stadium – Jack scored 74 on the Swans last year but amazingly, they are giving up the 3rd least amount of points in the last few rounds… but the 4th most 100+ scores. Crazy! He is averaging 115 in his last three and has had 100 and 113 at Etihad in his last two. Dayne Zorko v Adelaide @ the GABBA – How will he go without Rocky and maybe without Beams? Zorko had 84 on the Crows last year but they are struggling. Melbourne cashed in against them last week with 4 guys scoring over 110, led by their midfield group of Viney (132), Jones (124) and Oliver (116). Sam Jacobs v Brisbane @ the GABBA – The big fella is ranked at #4 over the last three weeks with an average of 130. Might be a little tougher against Stef this week though. Taylor Adams v Hawthorn @ the MCG – Over the last 3 weeks Hawthorn are currently ranked at, 4th easiest to score against, 2nd when giving up 100+ scores and #1 at giving up 120+ scores. Enter Taylor who has scored 115, 117 and 148 in his last 3 and despite only having 95 and 91 in his last two on the Hawks, he’ll be unstoppable. Sam Docherty v Fremantle @ Domain Stadium – ranked #5 on form, Doch has been great averaging 129 in his last 3 games. Hasn’t scored a ton on the Dockers in his career 4 games, but theat should change late Sunday afternoon. Todd Goldstein v Melbourne @ the MCG – He has scored in the 90’s for a while now but last week, Sam Jacobs had 74 hit outs (132pts) on the ‘ruckless’ Demons and this week, Goldy will be cracking a ton for sure. Lachie Neale v Carlton @ Domain Stadium – a big 36pts in the final term saved Neale last week and this week he’s back at home where he has scored 138 and 114 in his last two. Had 130 on the Blues last year, but this time it’s different, they currently sit as the hardest team in the game to score against over the last three weeks. 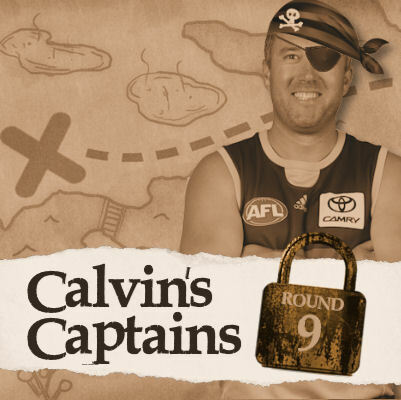 ODDS: For those who would like to see the odds for Calvin’s Captains for round nine, please follow the link provided right HERE. Predicted rain for Friday (cats and dogs). Bad for Duncan surely? hmmmm, raining cats and dogs for the cats and dogs match they reckon?? Yeah will go big, may even get 110 which will be amazing for owners. Robertson tagged for the Lions last week and did a decent job on Smith. Considering how much the Crows success revolves around Sloane, be likely he cops attention from Robertson. yeah, Sloane should be far better against Robertson than Smith was considering his ability to rack up contested possessions and tackles, while Smith relies primarily on the outside ball. The big question…keep Rocky till after the byes or hold…thoughts? josh kelly a potential PoD captain this week? Can’t see Titch getting tagged… Not really a match winner tho admittedly there’s not much else. Isaac Smith can hurt on the scoreboard if he’s let run free so maybe him? I don’t even think it’s likely Greenwood will have a run-with role at all. Didn’t against Carlton the other week, and only briefly on the weekend. I think it’s a horses-for-courses type deal, where if Bucks thinks there’s that ‘one guy’ that the opposition midfield revolves around, then he’ll give Greenwood an assignment. If anything he may throw a forward tag on Hodge, but I agree Mitchell isn’t that penetrating match winner type so can’t see it happening. In any case, it’s more likely than not going to be played in the wet, so I’d feel safer putting it on Merrett under the roof. Buckley allowing Murphy do as he pleased allowed Carlton to get the upper hand in the midfield and Carlton to win the game. I believe Greenwood spent some time on Doc during that game, but it didn’t achieve anything. Not a Buckley fan .Coulda won an ANZAC day game with a shot at goal 50 metres out ‘passed to Sav ….draw. Butler or Hannan has to go which one? Newman no doubt. Otten is playing back because of Lever’s injury keeping him out for at least 1 more week. I’d take Newman. Lever should be back in this week, play both. Balic given extended leave by the Dockers for a personal issue. Not gonna generate any cash or cover byes. Oh ffs! Honestly…. well butler lives on I guess. kelly, hanners or parker in for rocky? All great options,Kelly i guess,I think jpk is too cheap atm not to get. barrett and myers, help above mate ! Anyone thinking the sneaky big C on Sloane?!! although the NBN is predictably bad. and NBN cost $40 Billion – a bit more than sloane did a few weeks back. how bout rocky to koby stevens, and then polson to a mid pricer … can you afford walters then? of the two – Bont or Gaff as captain ? Seems like a lot of Rd 11 bye players to me. He’s decent value if you don’t care about byes and think Sydney’s back as a team, especially because of Sydney’s draw. Still, he has a high b/e of 102 if you need a few weeks to mull over your decision. +1 Merrett in for Rocky is almost a straight swap and gives you a captain option each week. Kelly looks to be having some kind of breakout year and is in the mix for top 8-16 but I feel Merrett will avg. 5-10 more. im a big fan of DT talk, and maybe not the best trader in the world, but if i have to sit and read profanity, I may as well not bother contributing. Whats wrong with you guys ?!? I think they might be 12 years old and drunk on half a beer at noon. Well, thats how they appear. I’m deleting these as we speak. Tracked IP addresses and also one of the not-so-bright comments (probably the same person doing all of them) left their St Peters school email address on there. I’m contacting the school now. Best Player To Get For 644k any position (besides ruck). No mention of Steph. Last 3 vs Adelaide 151,136,123. 117.5 avge vs Adelaide.